Absorb what is useful, discard what is useless, add what is uniquely your own. On November 27th, 2005, a monument in honor of Bruce Lee was erected at the Avenue of Stars, a Hong Kong tourist attraction located at the Tsimshatsui Promenade along the Victoria Harbor waterfront. Modeled after the Hollywood Walk of Fame and created, according to its official website, “to pay tribute to outstanding professionals of [the] Hong Kong’s film industry, to promote [the] tourism industry, and to consolidate Hong Kong’s position as Asia’s World City,” the Avenue of Stars was, quite possibly, the ideal location to unveil a 2.5-meter tall, 600 kg bronze statue honoring the industry’s all-time biggest star. The inscription at the base of the statue says it all: “Bruce Lee: Star of the Century.” The tribute, however, was a long time in coming. When repeated attempts to urge the government to find a way to pay homage to Bruce Lee stalled, members of the locally based Bruce Lee Club took it upon themselves to raise upwards of US $100,000 to commission a sculpture. This long-awaited tribute finally occurred on what would have been the martial arts superstar’s 65th birthday had he not died in 1973. The fact that it took over thirty years to create a public monument in honor of Bruce Lee in Hong Kong is—to say the least—peculiar, considering the actor’s enduring fame. What is perhaps even more peculiar is that another country had already beaten Hong Kong to it—and in Bosnia and Herzegovina, no less. Only a day before the unveiling of the statue in Hong Kong, the city of Mostar in Bosnia and Herzegovina unveiled a similar statue of Bruce Lee, making it the first public monument in the world to the international icon. This gold-plated bronze statue captures Lee in a familiar action pose –left arm raised with his palm facing outward, while his right hand grips his signature weapon, a pair of nunchaku. This statement—absurd to some, perhaps inspiring to others—confirms much of what Jachinson Chan has already said about the world famous martial artist in his 2001 book, Chinese American Masculinities: From Fu Manchu to Bruce Lee. He writes, “Bruce Lee’s popularity crosses cultural boundaries in terms of race, class, gender, sexuality, and nationality. He was an international hero” (74). And he still is, if the statue in Mostar is any indication. Bruce Lee, the man, may have been snuffed out in the prime of his life, but his image, if not his “spirit” endures. In Hong Kong alone, numerous pretenders-to-the-throne with stage names like Bruce Le, Bruce Li, and Dragon Lee sought to fill the void in the wake of Lee’s death, starring in dozens of unofficial sequels, heartfelt homages, and crass attempts to cash-in on Lee’s popularity, each bearing titles like Exit the Dragon, Enter the Tiger (1976), Clones of Bruce Lee (1977), and Bruce Lee Fights back from the Grave (1976). So prolific were these films that many casual viewers who believe they have seen a Bruce Lee film in their lifetime may likely have only seen one of these pale imitations. Lee’s “absent presence” even had a strong affect on his contemporaries and successors. Even future superstar Jackie Chan found himself pressured in his early films to imitate Lee’s persona before finding his niche as a more comedic, Buster Keatonesque kung fu star. Further, Lee’s impact on martial arts cinema internationally was so dramatic that it would be impossible to elaborate upon it here. Despite being known for only a handful of films, Bruce Lee has gained enough recognition to be chosen as one of Time’s “100 Heroes and Icons of the Twentieth Century” alongside such figures as Che Guevara, Harvey Milk, and Mother Teresa. This recent honor speaks directly to the man’s prolific afterlife in the realm of cinema, DVDs, books, video games, t-shirts, posters, and numerous other cultural artifacts. As Stephan Hammond and Mike Wilkins write, “What Elvis Presley was to rock ‘n’ roll, Bruce Lee was to celluloid kung fu” (204). So popular is Bruce Lee that one need not to have ever seen a Bruce Lee film to be familiar with who he is. In the succeeding paragraphs, I will examine Bruce Lee—the man, the myth, the legend—through the prism of articulation and multi-accentuality. 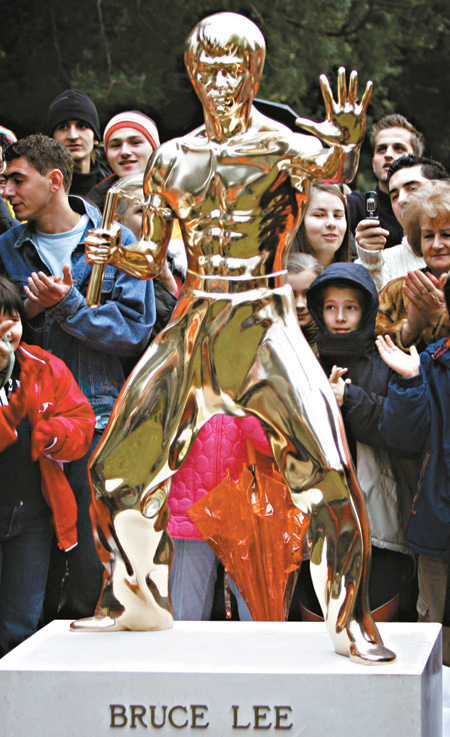 Why would a city in Bosnia and Herzegovina erect a statue of Bruce Lee? And how does it differ from the reasons for having one in Hong Kong? Does it differ at all? In other words, how could a national and ethnic icon for one group be a post-national and post-ethnic icon for others? In the essay, I will propose a way in which we can view these two monuments as direct evidence of Bruce Lee as an articulated and multi-accentual cultural figure. 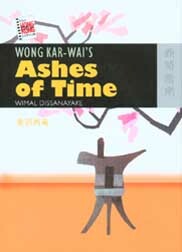 When I was attending the University of Hawai’i at Manoa, I did a keyword search of “Wong Kar-Wai,” and amongst the results, I was directed to a couple of HK cinema-related books that I had no idea existed. One was a booklength study of Ashes of Time by Wimal Dissanayake; the other was an equally extensive look at Happy Together by Jeremy Tambling. Both were extremely well-written, illuminating, and full of little known facts about the films. The idea that this would be an ongoing series was an exciting prospect for a Hong Kong cinema fan such as I. 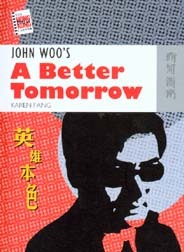 When I visited Hong Kong a few years back, I picked up a copy of Karen Fang’s informative look at A Better Tomorrow at one of the museum gift shops, and just recently, I finished reading Gina Marchetti’s take on the Infernal Affairs Trilogy. She does a heckuva job keeping everything that goes on in the trilogy straight, teasing out the implications of new, seemingly contradictory information we receive in the two sequels. To date, these are the covers of all the books in the series, save Lisa Oldham-Stokes’ He’s a Woman, She’s a Man and Tony Williams’ A Bullet in the Head, which aren’t coming out until May.